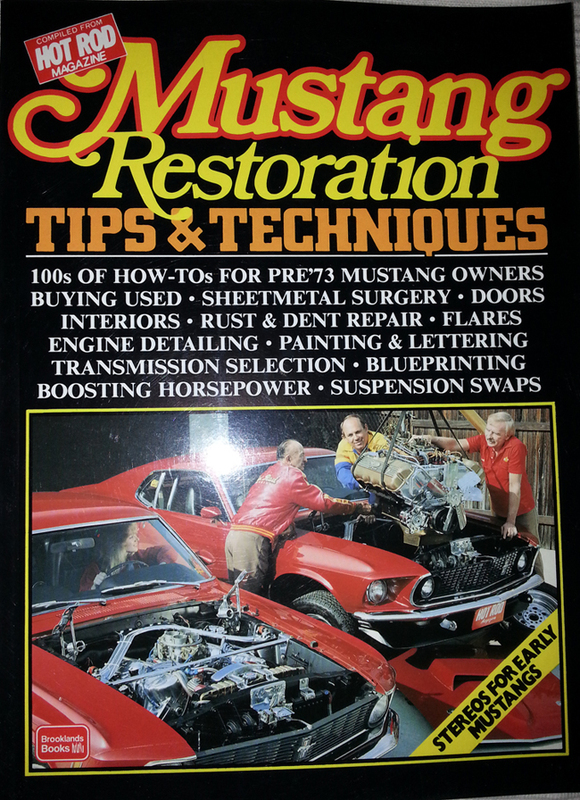 Published By Brooklands Books Compiled from Hot Rod Magazine! Aimed at pre ’73 models. Well the manual is paper back and just short of A4 in height. It contains 164 pages with some photos and they are all in black and white. The paper is a fairly good quality. There are 29 chapters in all, to many to list and it will read like the book if I do. Some of the sections are tips on how to buy, changing quarter panels, adding stereos, updating suspension and handling kits etc. The pictures in this manual are very similar to the Haynes manual, old-looking and but are clearer helped by the paper and are very black and white (contrasty). The pictures in the book are supported by the nice notes which works well as they are intended to be a step by step guide. This book is hard to nail down what it is or it’s trying to be. One minute it goes on about replacing original quarter panels, rebuilding the 289 engine block, all good stuff there so no complaints. But then it goes off on one on how to install a modern sound system into the classic Mustang. In other words it does a lot of the classic work on the basics and how to’s, then it goes on about adding decals and white lettering the tyres. The sections it does cover mechanically are good like replacing rear diff and stripping the engine etc. The manual does have many extra sections, like lowering the suspension, adding a supercharger and steel braided lines to the engine. Coming from Hot Rod magazine these are well thought out and explained, but these sections are aimed up pimping your ride to be honest. In order to do the updates you have to get the basics right mechanically and that’s what this manual tries to do. The particular sections or chapters are well explained and vary from just a couple of pages to over 10 or so for some of the sections. The 289 engine strip down and upholstery sections I like a lot. The interior is a job I want to do myself, such as the headliners, carpets, dash and so on. So all the little tips I found in here do add up and do give you a good idea of what to expect. Not really aimed at the classic car restoration guy, it’s more about getting an old car and bringing it up to date and making it look good. But saying that some of the basics sections are good and worth the purchase price. Not a real restoration manual back to original specs for the enthusiasts , but it will show you the basic mechanical workings and a lot of other stuff to trick your ride out. Maybe I will do some of the projects, but I can’t see it to be fair. Not my most favourite of restoration manuals, but it does earn the right to be on my shelf in the shed.